I could write reams about him but will try and keep it fairly brief...after buying all his solo material when it came out after that gig and through the early 1980s, I eventually got to meet Nash in 2008 when a member of the band I was in had the idea to invite him over to tour with us around the UK. Mad idea - but it paid off! He said yes and a deal with Flag Promotions was done to bring him over from Toronto, where he still lived. I can still remember meeting him for the first time at the rehearsal studio in a converted farm building not far from where I live. He sat on the sofa while we went through a few songs that we did (we played Gary Numan songs). A nerve wracking moment until I saw his foot tapping away - fortunately we passed the test! Then he plugged in. To hear that wall of sound of his when he picked up his bow and played - a sound I'd loved since seeing him in Coventry in 1980 - well, it was quite something; there it was, live in front of me. While on the tour it was Nash’s idea to share his stage time with us - on most of the dates, we would play our set, he would play his - and then he’d invite us back on stage to play a few Numan songs - including You Are, You Are, a track he’d played on that Numan had never done live at that point; always went down a storm. For a few nights on the tour he stayed in my house - he loved the view out over the countryside from our back garden and used to sit out there to relax - he posted a pic of it on his site at the time. I also took him shopping for bandages (as a long term fan, that was quite surreal - but hey, I guess he had to get them somewhere!) and to the dry cleaners to get the famous white suit cleaned in a short break between gigs. 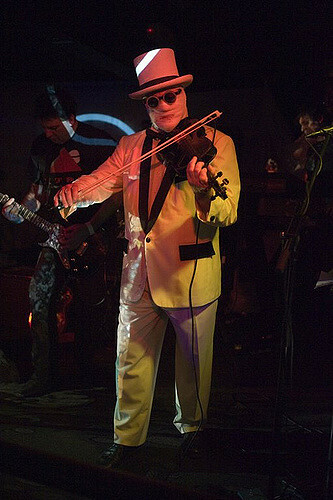 Nash retired from music in 2012, and sadly died on 10 May 2014. It was an honour to play with him - at his best he was a generous and talented musician, happy to share the stage with a few nobodies (that was us) and bring us up to his level. His website and music live on - go HERE for both. 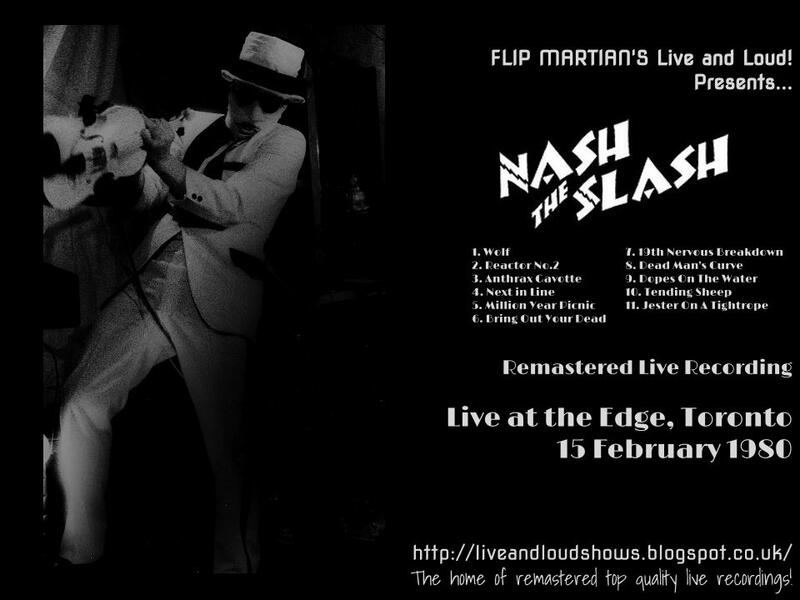 Anyway, long before I met him, the story goes that Gary Numan came across Nash playing at The Edge club in early 1980 and immediately invited him to support him on his tour of Canada and North America - which started in Toronto on 18 February. I can’t say definitively this is that same gig, but being a few days before, I guess there’s a good chance. This show, featuring several rare tracks and early versions, was apparently an FM recording but was very tinny and thin sounding if it was. I spent a lot of time EQing this to bring out the bass and drum machines a bit, while keeping the trademark mandolin and vocals to the fore. I hope you agree it’s an improvement. This show is dedicated to Nash, and to those who knew him and called him a friend. I hope they enjoy this and approve of what I've done. And hopefully there will be 1 or 2 more in the near future. The show is available for download for free HERE as 1 MP3 file. Or, if you would like to have separate tagged MP3s, or even lossless files in FLAC format, head on over to the Donations tab to see how you can obtain these for a very small donation towards the site costs. thanks for all the hard work and making Nash available to fans!! My pleasure - no doubt there will be another Nash show before the year is over. Cheers! Thanks for this from a huge Nash fan. 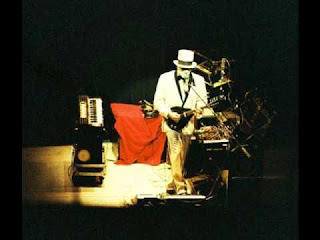 I saw him live in Oxford in 1980 and in London in 2008. He's much missed as a musical innovator and as an uncompromisingly independent contributor to the industry. Any further live material would be much appreciated! Agreed; much missed. I'm sure there will be at least 1 more Nash show this year - hoping to receive some to check out this week. 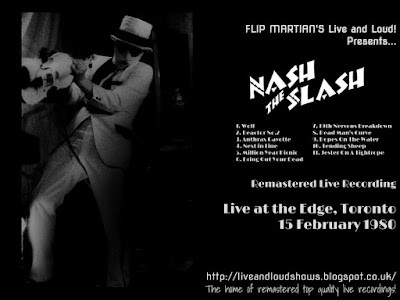 this nash the slash show is a very enjoyable listen and flip is right... play it loud!